Dena Tollefson is an American artist whose bold contemporary oil paintings focus on joyful use of color, texture and movement. Dena Tollefson (nee Dena Schaefer), born 1965, is a full-time, professional artist. Tollefson graduated from Iowa State University in 1988 and lived in Dallas Texas before returning to Iowa in 1991 where she developed her unique, highly textured oil painting style. She lives in Cedar Rapids, Iowa with her husband and family. Her "Daubism" body of work is a unique process she developed, where "daubs" of individually mixed oil paint are applied with a palette knife. The largest daubs are applied with a serving spoon, allowing ridges of paint which catch the light and appear to dance and scintillate as the viewer moves past the painting. Tollefson’s work focuses on botanicals, ponds, skies, and her Corn Series of work, biographies where people are depicted as ears of corn. Her work is highly tactile. Two of Dena Tollefson's paintings are in the permanent collection of the Cedar Rapids Museum of Art. Tollefson completed a set of 4 commissioned paintings for the CEO of Starcom MediaVest in downtown Chicago. Her work hangs publicly and in private collections throughout the US. She has exhibited in juried shows in Texas, New York, California and Georgia and has won awards at the national and local level, as addition to participating in 21 gallery group shows. She is a member of Allied Artists of America and the Oil Painters of America. Merrill, National Gallery of Art Washington, D.C. Chief of Conservation. 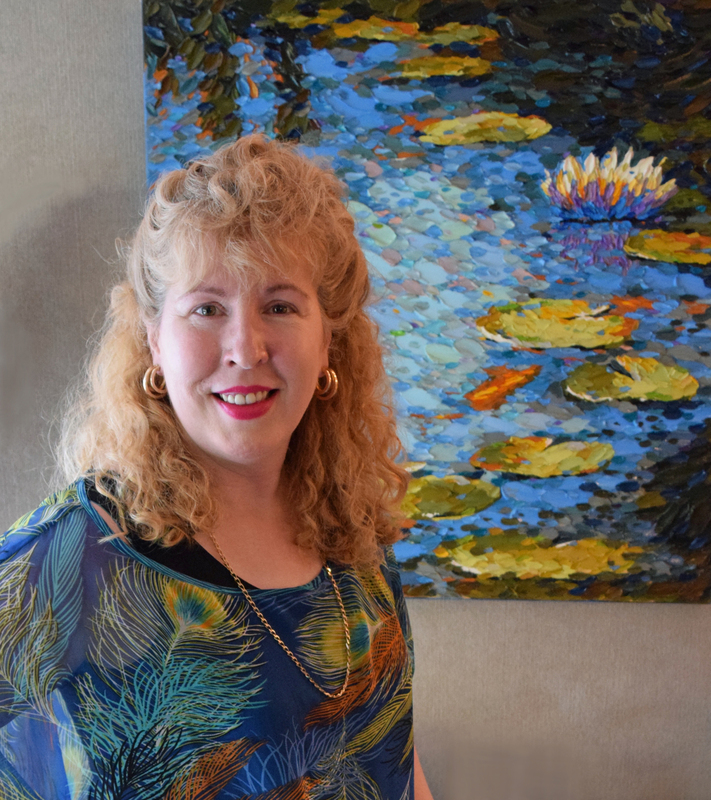 "I am a Colorist and am known for contemporary realism focusing on botanicals and landscapes, especially ponds and portraits in corn. I employ vigorous brushwork and texture through the palette knife in my work so that people may experience along with me the "feel" of the painting. I find mosaics facinating how the individual pieces all contribute to the whole- I want my paintings to have a similar idea where overlapping petals of paint all stand on their own and then contribute to the total. My work known as "Daubism" is created using a palette knife where each stroke of color is isolated from the others. Most paintings will have hundreds of different colors, these colors are all individually hand-mixed from a limited set of colors creating unique colors which relate to one another. I am striving for a sensual, tactile surface in paint."